The ambience at SKPVIS inspires learning and the facilities are truly sophisticated and world class. The Smart Class is a comprehensive solution designed to assist teachers in meeting day-to-day classroom challenges and in enhancing the academic performance of students with simple, practical and meaningful use of technology. The Smart Class has a unique delivery model wherein a Knowledge Center is connected to the classrooms through the Internet. Teachers get the relevant digital resources such as animations and videos; interactive virtual lab tools etc. and use them as a part of their lesson plans in every classroom period. 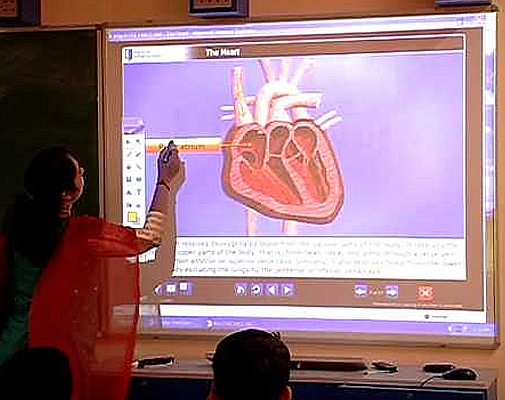 The classrooms are equipped with state-of-the-art infrastructure, complete with custom designed electronic interactive white boards, projection systems, PC’s and UPS. This makes learning an enjoyable experience for students while also improving their overall academic performance.